By Cindy YurthCalling the First Couple "people like me," Fort Lewis College Student body President Byron J. Tsabetsaye introduced Michelle Obama to an enthusiastic audience of about 3,500 at the college's Whalen Gym Wednesday. The First Lady was in town campaigning for her husband. 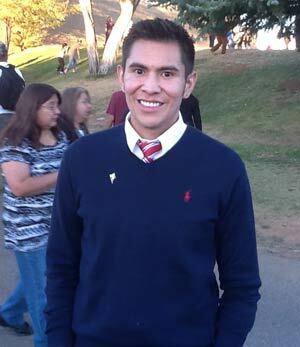 Tsabetsaye, a 27-year-old English major who traces both Navajo and Zuni blood, said it was President Obama who inspired him to seek his elected office at Fort Lewis. "I wasn't always into politics growing up," Tsabetsaye told the standing-room-only crowd, some of whom had stood in line three hours to get in. "I grew up in Arizona on the Navajo reservation." The mention of the reservation drew loud applause from the several hundred Native Americans in attendance. "I didn't know there was a possibility for me as a kid to hold elected office," Tsabetsaye continued, "or even be in a leadership role. All that changed in 2008" with the election of a person of color as President. Tsabetsaye, who is Ashiihi born for Tachiinii, called Barack and Michelle Obama "people who, like me, didn't come from a privileged background" and said they "inspired me to reach higher. "Comment: For more on Michelle Obama, see Michelle Obama on "Doing the Impossible" and Lyons Explains Lacrosse at White House. Below: "Fort Lewis College Student Body President Byron Tsabetsaye beams after leaving First Lady Michelle Obama's address at the college Wednesday." Too bad you didn't mention the Kiowa Apache that gave the invocation.